Born: March 17, 1823 in Sandwich Ma. 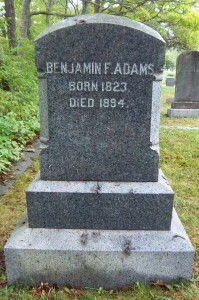 Died: August 13, 1894 in Bourne Ma. at 71 yrs, 5 mos. 1. Eli Coville Adams; (November 28, 1846 – 1920); Married Amanda J. Chubbuck (1850 – 1946) (Weldon Chubbuck & Hannah J. Gammons) in Middleboro Ma. on March 20, 1869; He was a moulder; He & Amanda are buried in Melrose Cemetery in Brockton Ma..
2. Angeline C. Adams Gammons; (1849 – 1926); Married Curtis T. Gammons (1838 – 1905) (Calvin Mitchell Gammons & Sophia Fuller) in Middleboro Ma. on March 2, 1866; Angeline & Curtis are buried in Melrose Cemetery in Brockton Ma..
3. Martha/Mattie Ellis Adams Swift; (September 9, 1851 – December 30, 1935); Married Charles Edwin Swift, Civil War (1834 – 1909) (Charles B. Swift & Zebiah K. Hewins) in Sandwich Ma. on May 30, 1869; Martha/Mattie & Charles are buried in Cataumet Cemetery. 4. Deborah/Frankie F. Adams Avery; (May 8, 1853 – March 15, 1877); Married Zemira J. Avery (1849 – 1896) (Gilbert Ellis Avery & Reliance Taylor) in Sandwich Ma. on November 12, 1871; Zemira married (2) Sarah Frances Pulsifer (1852 – ?) (Joseph Pulsifer & Elanora F. (–)) in Pocasset Ma. 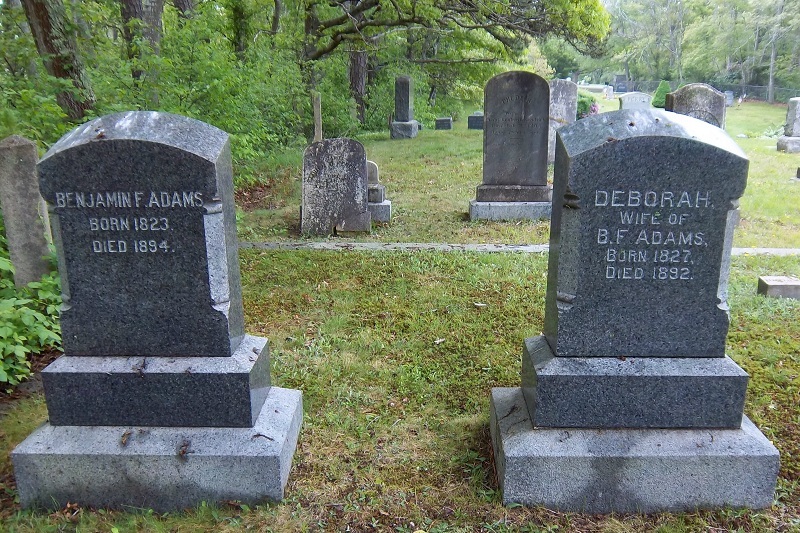 on December 1, 1878; Deborah/Frankie & Zemira are buried in Pocasset Cemetery. 5. Ida S. Adams Witham; (April 6, 1855 – 1932); Married Edwin Francis Witham (1853 – 1921) (John Witham & Elizabeth J. Wright) in Pocasset Ma. on November 26, 1874; Edwin was a boxmaker; They lived in Middleboro Ma. & are buried in South Middleboro Cemetery. 6. Charlotte/Lottie P. Adams Chubbuck; (December 23, 1856 – 1939); Married Benjamin Franklin Chubbuck (1854 – 1922) (Weldon Chubbuck & Hannah J. Gammons) in Sandwich Ma. 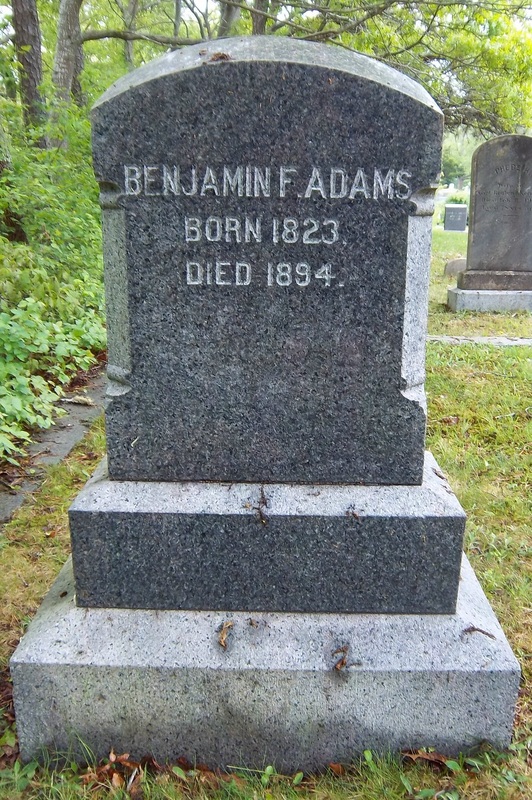 on November 25, 1875; Benjamin was a boxmaker; He & Charlotte/Lottie are buried in Melrose Cemetery in Brockton Ma..
7. Effie D. Adams Sherburne; (December 27, 1860 – 1933); Married Frank Melvin Sherburne (1865 – 1940) (Joel E. Sherburne & Annie Elisa Young) in Brockton Ma. on October 19, 1898; Frank worked in a shoe factory; He & Effie are buried in Melrose Cemetery in Brockton Ma..
8. Elizabeth/Lizzie Williams Adams Chase Reynolds; (April 1862 – 1943); Married (1) George Coffin Chase (1858 – 1919) (William J. Chase & Mary E. Pitts) in Brockton Ma. on July 2, 1881 & married (2) Luke Webster Reynolds (1857 – 1937) (Charles Turner Reynolds & Sarah Stevens Knowles) in Pocasset Ma. on October 21, 1891; George married (2) Ada Janet Jones (1870 – 1966) (John E. Jones & Sarah Smith) in Brockton Ma. on January 11, 1893; Luke married (1) Eva Ellen Parks (1860 – ?) (Henry Porter Parks & Ellen Lucinda Peets) in Brockton Ma. on May 1, 1879; Elizabeth/Lizzie & Luke are buried in Melrose Cemetery in Brockton Ma. ; George & Ada are buried in Prospect Hill Cemetery in Nantucket Ma..
9. Carrie Eudora Adams Taber; (March 14, 1865 – 1955); Married Horace Taber (1868 – 1938) (Charles Henry Taber & Sarah Florence Stoddard) in Brockton Ma. on August 1, 1887; Carrie & Horace are buried in Melrose Cemetery in Brockton Ma..
10. Lester H. Adams; (June 12, 1868 – May 12, 1869); Lester died at 11 mos, 2 d. & is buried in Pocasset Cemetery with his parents & Martha (below). 11. Martha Adams; In the same plot with Benjamin & Deborah, there are 2 small stones marked “Lester” & “Martha”; There is no record of Martha in this family other than Martha/Mattie Ellis Adams Swift (above) & she is buried in Cataumet Cemetery.